Universal Nutrition markets a popular line of "Animal" products that includes Animal Pak, animal stak, animal nitro, animal cuts, animal max protein, animal flex, animal test, and animal pump. We will be reviewing their Animal Pump supplement here. Universal Nutrition has made a good name for themselves making reliable products that delivers results. Don't just take my word for it, see our user reviews section on Universal Nutrition products, and see what others users have said about Universal's Animal products - click here to view the user reviews. I've used a few of their Animal line of products in the past with great results, so when I picked up a 30 pack container of the Animal Pump, I was expecting much of the same quality and results. If you're familiar with their Animal supplements, you'll know that the defining feature of this line of products is that most of them are comprised of pills, and lots of them! Animal Pump is no exception. I think it is also an interesting fact to mention that it seems like many of these Animal products kind of stink (unpleasant smell), but by all means, don't let this turn you off from the Animal supplements, they are truly fantastic supplements. 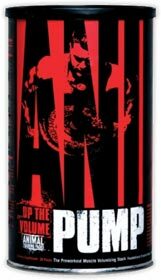 Universal Animal Pump is a pre-workout creatine matrix in what Universal calls a "foundational cell volumizer", and "nutrient transport system". Each container comes with 30 packs of pills, and each pack contains 9 (yes, nine) pills, including 4 yellow pills, 3 brown pills, 1 white pill, and 1 red pill. That sure is a lot of pills to swallow! Let's take a look at the ingredient details of Animal Pump. Other Ingredients: Methylxanthine Complex (50% kola nut extract and 22% guarana extract), cinnamon root extract, evodiae fructus extract, fenugreek extract, vinca minor L. extract, gelatin, dicalcium phosphate, microcrystalline cellulose, titanium dioxide, stearic acid, magnesium stearate, FD&C Yellow. While they do not tell you which pill contains what, they do label clearly that the energy rush complex is contained in the red pill. So if you don't want to take any stimulants for whatever reason, just remove the red pill. Let's take a look at what's included in these complexes. Mg2+-creatine chelate and a low-dose creatine supplementation regimen improve exercise performance. Selsby JT, DiSilvestro RA, Devor ST. Section of Sport and Exercise Sciences, The Ohio State University, Columbus, Ohio 43210, USA. This study tested the hypotheses that, compared with a placebo group or creatine (Cr) group, a Mg(2+)-Cr chelate group would demonstrate improvements in the 1 repetition maximum (1RM) on the bench press and be able to perform more work at 70% of the 1RM for the bench press. 31 weight trained men were randomly assigned in a double-blind manner to a placebo group, a creatine group (2.5g daily), or a Mg(2+)-Cr group (2.5g daily). Baseline data were collected for the bench press 1RM and maximal work completed during a fatigue set at 70% of the 1RM. Following 10 days of creatine supplementation, follow-up tests were completed for the dependent variables. Magnesium-creatine supplementation effects on body water. Brilla LR, Giroux MS, Taylor A, Knutzen KM. Exercise and Sport Sciences Laboratory, Western Washington University, Bellingham, WA 98225-9067, USA. This study evaluated magnesium-creatine (MgCre) supplementation on body water and quadriceps torque. A Placebo, Mg oxide plus creatine (MgO-Cre), and Mg-creatine chelate (MgC-Cre) at 800 mg Mg and 5 g Cre per day were used for 2 weeks in 35 subjects in a random assignment, blinded study. Based on these two studies, we can conclude that Magnesium Creatine Chelate helps improve exercise performance, and in some instances, has a greater effect on muscle torque compared to other creatines. As mentioned in the second study, MCC seems to increase the intracellular water which may infer more muscular creatine, and possibly lead to increased protein synthesis. However, it remains to be seen whether MCC is better than regular creatine, as the first study found that MCC group and creatine group had similar performance results. TriCreatine Malate is made from creatine monohydrate and malic acid. Creatine ethyl ester HCL (CEE) is a derivative of creatine monohydrate, sold as an athletic performance enhancer and promoted as being better than creatine monohydrate for building muscle and strength. It is an ethyl ester derivative of creatine - the ethyl ester is claimed to promote a much better absorption rate than regular creatine in the body. However these claims are not supported by scientific studies, and in fact some studies have actually found CEE to be less stable than regular creatine. There are numerous claims of the benefits of CEE over regular creatine that circulates around in various promotional literature; however, much of it is false. I won't go in much detail about CEE here, since we have a review of Creatine ethyl ester here that goes into much detail about it. The NO complex of animal pump includes AAKG, OKG, citrulline malate, l-carnosine, and l-norvaline. AAKG (L-Arginine-alpha-ketoglutarate) - basically, AAKG is a substrate for production of Nitric Oxide, which is what does the "Hemodilating" - dilating the blood vessel and allowing for more blood flow, which is what gives the "pumped" feel". I won't go in detail on how this works. You can read more about AAKG and NO here. L-Carnosine - is a dipeptide of the amino acids beta-alanine and histidine. It is highly concentrated in muscle and brain tissues. L-carnosine has been shown to have antioxidant properties. It has been proven to scavenge reactive oxygen species as well as alpha-beta unsaturated aldehydes formed from peroxidation of cell membrane fatty acids during oxidative stress. Because of its antioxidant, antiglycator and metal chelator properties, carnosine supplements have been proposed as a general anti-aging therapy. Beta-Alanine supplementation augments muscle carnosine content and attenuates fatigue during repeated isokinetic contraction bouts in trained sprinters. Derave W, Ozdemir MS, Harris RC, Pottier A, Reyngoudt H, Koppo K, Wise JA, Achten E.
The aim of this study was to determine whether oral supplementation with beta-alanine during 4 wk would elevate the calf muscle carnosine content and affect exercise performance in 400-m sprint-trained competitive athletes. 15 male athletes participated in a placebo-controlled, double-blind study and were supplemented orally for 4 weeks with either 4.8 g/day beta-alanine or placebo. Muscle carnosine concentration was quantified in soleus and gastrocnemius by proton MRS. Performance was evaluated by isokinetic testing during five bouts of 30 maximal voluntary knee extensions, by endurance during isometric contraction at 45% maximal voluntary contraction, and by the indoor 400-m running time. The study found that beta-Alanine supplementation significantly increased the carnosine content in both the soleus (+47%) and gastrocnemius (+37%). In placebo, carnosine remained stable in soleus, while a small and significant increase of +16% occurred in gastrocnemius. Dynamic knee extension torque during the fourth and fifth bout was significantly improved with beta-alanine but not with placebo. Isometric endurance and 400-m race time were not affected by treatment. The study concluded that oral beta alanine supplementation increased muscle carnosine, and that carnosine loading significantly reduced fatigue in repeated bouts of exhaustive contractions. As can be seen from the list of ingredients for the NO Blast Complex, Universal Animal Pump delivers the key ingredients that stimulates NO production (AAKG, citrulline malate) along with ingredients which attenuate muscle fatigue (OKG, L-Carnosine). These combined should in effect increase nitric oxide production leading to the "pumped" feeling, and at the same time, reduce muscle fatigue during intense workout allowing you train harder. (Continues in part 2). 1. J Strength Cond Res. 2004 May;18(2):311-5. In vivo induction of insulin secretion by ornithine alpha-ketoglutarate: involvement of nitric oxide and glutamine. Schneid C, De Bandt JP, Cynober L, Torres E, Reach G, Darquy S.
Inserm U 341, Hôtel-Dieu Hospital, Paris; and the Laboratoire de Biologie de la Nutrition, Paris 5 University EA 2498, Paris, France. 5. J Appl Physiol. 2007 Nov;103(5):1736-43. Epub 2007 Aug 9.